Extensive and complex population surveys of the Critically Endangered Gharials in the Corbett Protected Area over six years have revealed surprisingly heartening results. After going nearly extinct in 1974, the park is now home to the third largest breeding population of this ancient crocodilian species – providing both hope and direction for its further preservation. Corbett Tiger Reserve, in the state of Uttarakhand, is one of the country’s finest protected areas in the Shiwalik landscape. The core area of the reserve, formerly known as Hailey’s National Park, was the first such park to be created in the whole of Asia in 1936. It was renamed as Corbett National Park in 1956-57, and declared a Tiger Reserve in 1991. The reserve is situated at the foothills of western Himalayas and covers an area of 1,288.3km2, spread over the districts of Nainital, Almora and Pauri Garhwal. This comprises the areas of the Corbett National Park, Sonanadi Wildlife Sanctuary and buffer areas. Because of the undulating topography, the altitude varies greatly and ranges from 330m to 1,200m. In 1974, the Kalagarh Dam was built over the Ramganga River, creating the Kalagarh reservoir and alternating the riverine habitat to a predominantly lake-like habitat. The aquatic territories of the reserve consist of Mandal, Palain and Sonanandi rivers, all tributaries of the Ramganga, the Kalagarh reservoir and numerous mountain springs, locally called sot. It is in this aquatic landscape of Corbett, that you will find the Critically Endangered Gharial, the main focus of my study. It was over four decades ago, back in 1974, when the first ever crocodile surveys were carried out in Corbett. Even back then, the surveyors were especially interested in the Gharial – a strange looking, long-snouted crocodile, which showed a preference for free-flowing rivers and a diet dominated by fish. The team, consisting of Romulus Whitaker, Dhruvajyoti Basu and Charles Andy Ross, spent over a month in the park, during which they observed a non-breeding population of five adults. 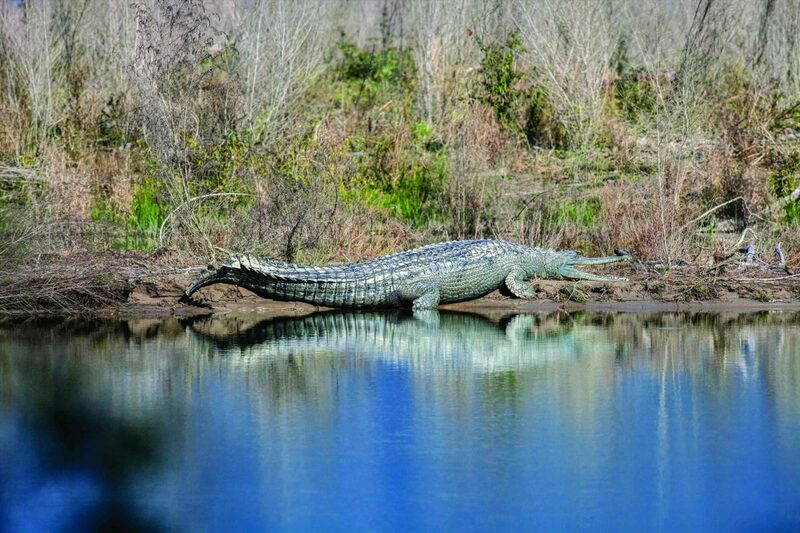 Local reports suggested that Boksar was known to be one of the best places to observe Gharials nesting in Corbett. The surveyors predicted that with the damming of the Ramganga River near Kalagarh, and the expected inundation of nesting grounds at Boksar, the future of Gharials in Corbett seemed bleak. In 2007, the Gharial was uplisted by the IUCN Redlist as Critically Endangered from Endangered. 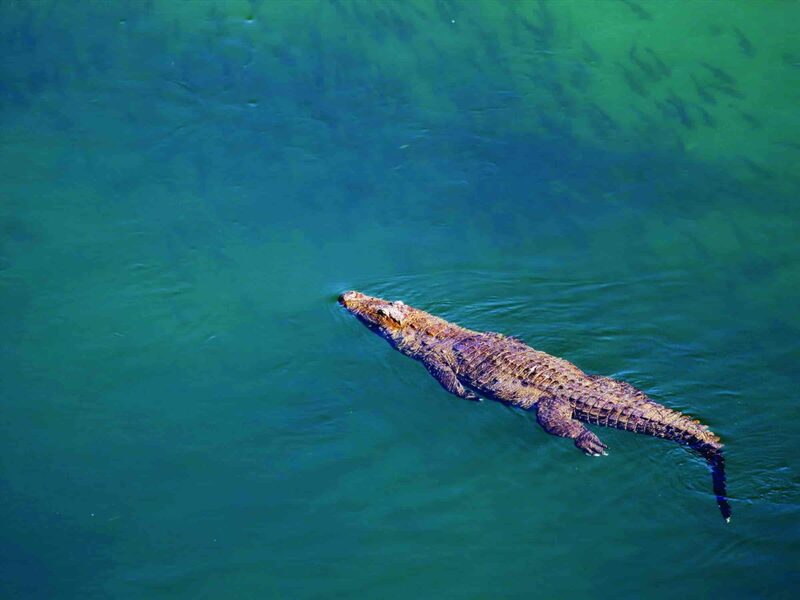 At this time, Corbett TR was believed to harbour only a few Gharials, about 10 adults, remnants of the 257 captive-bred Gharials released in the Ramganga River between 1985 and 1994. It was believed that the Ramganga River and the Kalagarh reservoir were not hospitable for the Gharial. However, with the uplisting of the species in 2007, I was keen to survey Corbett TR to check the actual status of the Gharial. With support from the Forest Departments of Uttarakhand and Corbett TR and some financial backing, I started my surveys in February 2008. Assisted by a range officer and a boat operator, I started surveying along the Dhikala shorelines, expecting to find more Muggers than Gharials. I still remember the first Gharial sighting when we started the survey – as I approached a group of crocodiles, I was actually astonished to find a large adult Gharial basking on the shoreline. As I continued my surveys, reports about crocodile sightings came from other parts of the park and from Sonanadi WLS. Modifying my field plan, I decided to cover the entire reservoir and Palain and Sonanadi Rivers, instead of just Ramganga. The results were astounding! There were over a hundred Gharials in Corbett and 42 of them were adults, consisting of 10 males. Gharials were not just thriving in Corbett, but the park was supporting the third largest population of the species (behind Chambal and Katerniaghat sanctuaries) in the world. No one, including me, was expecting this result. But unlike elsewhere, the Gharials in Corbett lived largely in a lake-like environment, mainly in the Kalagarh reservoir. Corbett TR, housing 20% of the global population of wild, adult Gharials, now became important from the point of view of conservation of a species on the verge of extinction. But with the discovery of this population, several questions rose. Is this newly discovered population increasing or decreasing in number? How were these animals able to adapt to the lake-like conditions of Kalagarh reservoir? Is nesting happening in Corbett? If yes, how successfully? The preservation and conservation of this species in Corbett TR had now assumed special importance, which could only be accomplished by gaining an insight into its population dynamics and nesting ecology. After I was invited to study the crocodiles and freshwater turtles of Corbett in 2009-2010, I started with the gruelling task of raising the necessary funds for the equipment and field work, while the logistical support was provided by the Uttarakhand and Corbett TR forest departments. The Gadoli and Manda Khal Wildlife Conservation Trust was our supporting NGO for the project. I teamed up with Dr. Alison Leslie, of the University of Stellenbosh in South Africa and Regional Vice Chair of the IUCN SSC Crocodile Specialist Group for South and East Africa, to start the fieldwork. With an individual grant from the MBZ Species Conservation Fund, my first step was an awareness initiative for the frontline staff in the project area, so that they would develop a basic understanding of these species. Visiting the forest staff at their forest quarters, our routine included a field visit in a day, followed by a specially designed audio-visual presentation and a Q&A session. We often spent time studying crocodile signs in the wild and observing the natural behaviour of the Gharial on the Ramganga. As a part of this initiative, we even developed a booklet on the crocodiles of Corbett TR in Hindi, especially for the frontline staff of the reserve. The next phase of the project was to focus on the Gharial estimation and nest surveys, which were the most challenging components of the project. Tackling the dynamics of the Kalagarh reservoir shoreline was a challenging prospect while counting Gharials. Working with the forest staff, I surveyed much of the Corbett NP area of the reserve during the winter months. Armed initially with a pair of binoculars and my data sheets, I counted basking Gharials to arrive at an estimate of these animals in Corbett NP. Surveys in the marshes of Dhikala were difficult, as the Gharials would often hide in the backwaters and the ever-changing shoreline posed a further challenge in the estimation work here. As field workers are a rare commodity, especially those proficient with crocodile surveys, proper techniques and procedures were hard to implement. Thus, while developing an implementable survey method, I focused on upgrading my field survey equipment in 2012 to include an inflatable boat fitted with an electric boat engine. I could now access shallower areas of the areas of the shoreline, where Gharials basked, and with no noise from the engine. Next procurement was a set of time lapse cameras, which when set up near Gharial basking sites, would assist in stationary counts by photographing the animals at 10 second intervals for an entire day. I again spent the winter months inside the Corbett NP counting crocodiles, while simultaneously selecting locations for placing the trail cameras and routes for boat surveys along the shoreline. The Dhikala population turned out to be the largest in the national park, but smaller populations existed in Boksar and in the Ramganga River. Surveys in each of these areas had to be conducted by different methods. While much of the reservoir areas of Boksar, Dhikala and Gaujeda were surveyed by boats, the Ramganga River, from Gairal to the confluence of the reservoir at Dhikala was surveyed on foot. To estimate the population of Gharials, we count the maximum number of individuals in a particular size category, and then assume that the average number would be the best estimate for that particular size category for that year. We concluded that there were 52 adults in Corbett NP, compared to 35 in 2008, indicating that the Gharial population had increased by a staggering 48.5%. We also saw yearlings during the 2014 surveys, which suggested that nesting is likely to be occurring in Dhikala, but this needs further investigation. Doing nesting surveys is challenging in Corbett NP. 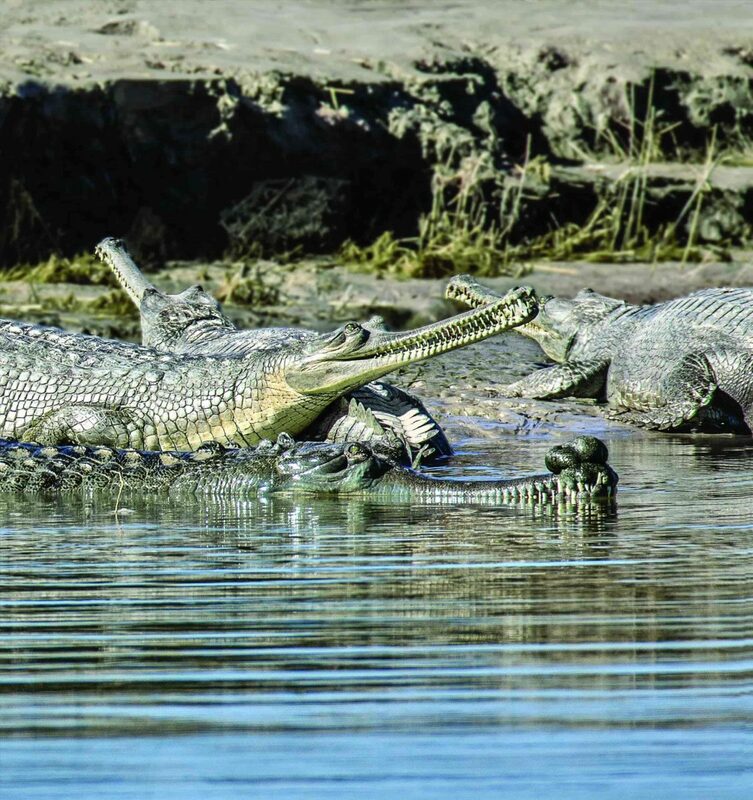 It seems difficult for Gharials to nest in the national park area due to the lack of sandy banks and the submergence of the major nesting sites at Boksar after the formation of the reservoir in 1974. The Gharial is a hole-nesting crocodile, with an average size of 45-60 eggs per clutch and lays its eggs in seasonally available sand embankments. Gharials are known to mate in the winter months, between November to January, and females generally lay their eggs through the months of March and April, sometimes even in May. Incubation takes 60-90 days and parents are known to assist in hatching by exhuming egg clutches at the time of hatching. Hatchlings stay with their parents near the nesting site and there is some amount of parental care displayed. I had recorded Gharial nesting at Boksar and Palain River in 2008, and again at Boksar in 2011. Equipped with the inflatable boat, I was looking for Gharial tracks on the sandy banks that were left when they leave the water to nest. I recorded 13 different clutches in 2012-2013 season and 11 in 2013-2014 season. It seems that the dynamic water flow and water management system of the Kalagarh reservoir did result in seasonally available sand embankments during low water levels and Gharials were using this successfully. While during the 2008 and 2011 surveys, I was only able to record monitor lizards predating on Gharial eggs, between 2012 and 2014 (2 seasons), we recorded about 600 hatchlings at Boksar alone. Our surveys once again confirmed that Corbett is home to the third largest breeding population of this Critically Endangered crocodilian, contributing about 20% towards the wild population. Housing about 200-250 adult Gharials (IUCN 2008), this becomes an important conservation area for this species, which is on the verge of extinction. The uniqueness of this population is that it lives largely in a lake-like environment and is perhaps the only population in the world doing so in the wild, giving more importance to its conservation and preservation. Subir has graduated in Forestry from HNB Gharwal University and is at present pursuing his post graduation in the same subject from Doon College of Agriculture Science and Technology. He is also a trustee of the Gadoli and Manda Khal Wildlife Conservation Trust and is associated with the IUCN SSC Crocodile Specialist Group and the IUCN Working Group on Biodiversity Offsets as a member.